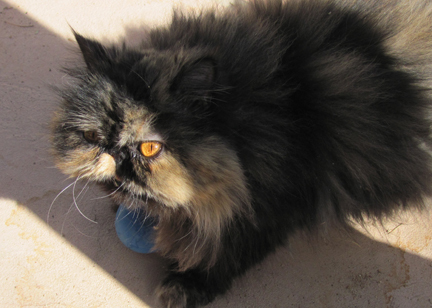 Zoe, our pampered Persian house cat, likes to hang out with us on the patio…especially on the weekends. It’s really funny, because, sometimes she gets little wound up, as the kitty adrenaline kicks in- she explores her wild roots! As we sat on the porch, Saturday afternoon, she got in one of her ‘moods’! 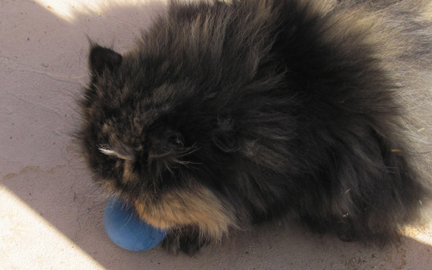 You know Zoe’s wound up when she plays with her ball! She’ll bat it around, chase it, then gather it up in her paws and roll around with it…just like a puppy! But, then, Zoe thinks she’s more dog than a cat! 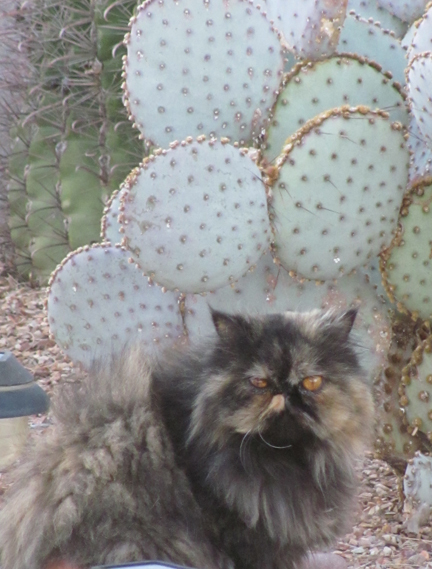 She ventured out into the yard to explore a little “Catcus” and commune with the Prickly Purr…. 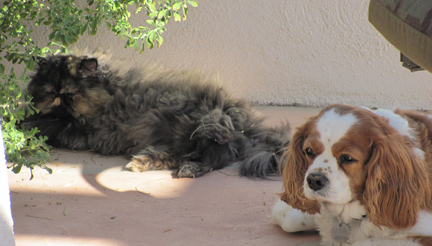 She did a little sunbathing with her bro!…. 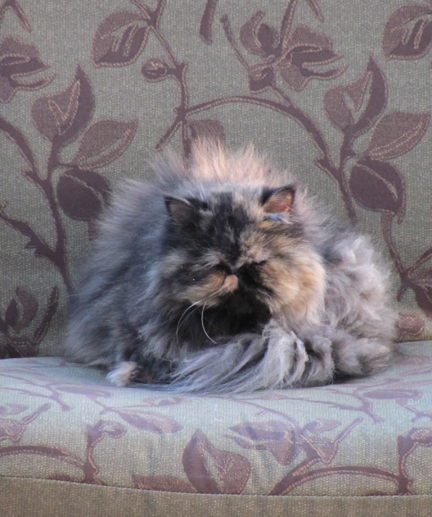 And at last, found the perfect perch on her favorite patio chair just as the sun began to set…..
As I got ready to go to bed Saturday night, this was the last image I had of Zoe….did she come in the house with us when we all came in for dinner? I got out of bed, peered out through the blinds, into the moonlit night. I didn’t see anything. I turned on the porch light and scanned the porch…nothing. Then I happened to catch a movement. I looked down….there was the mighty wild cat looking up at me with a huge grin on her face- or perhaps it was a look of sheer terror! What ever… I opened the door and she swaggered into the house and headed straight to bed. I think she gets a kick out of testing fate-luckily, the bobcats, coyotes, owls, or other night predators didn’t find a furry little snack in Todd’s Backyard! ← The Cottontail Club…Where great bunns like to party!